For many people, life may be a bowl of cherries. Laura Case would probably agree, though with a twist. For her, those cherries are in the form of cherry balsamic vinegar infused into dark chocolate truffles. That’s because Laura is the owner and proprietor of Beijo de Chocolat, a Portuguese/French hybrid name that means “Kiss of Chocolate.” She had her own store in Chicago for several years before moving back to her home state to be near family. “I’ve been here a little over a year,” Laura says. “Here” for Laura is Petoskey. The Detroit native has a sister who lives in Boyne City. Laura came to chocolates naturally enough: She was an award-winning news producer for a television station in Chicago, and from there it was only a short step to—wait a minute, TV news? Yep. Laura is a veteran of television news for Fox and CBS affiliates, with several journalism awards and Emmy nominations to her credit. But she tired of the daily grind. “I decided I wanted to do something different,” she says. How different? She enrolled in the French Pastry School in Chicago. And the chocolate loved her right back. She began experimenting with various flavor combinations and eventually opened her own store in Chicago. She served coffee, tea and hot chocolate, along with a few pastries. But it was the handmade candies and chocolates that made the store a must-stop. Laura got enough love from her customers that she decided to see how her sweets stacked up against the competition. “Three years ago I entered the national chocolate competition in San Francisco,” Laura says. She was thrilled to win eight gold medals and earned the title of Grand Master Chocolatier. She was one of only 12 Grand Master Chocolatiers at the time. Today she doesn’t have a storefront but is a familiar face at the local farmers’ markets. “I’ve been doing Charlevoix, Boyne City. In the winter I do the Petoskey indoor market,” Laura says. 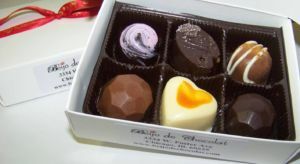 For more details on Laura’s numerous truffles, toffees, bark, cakes, cookies and other sweet treats, visit the Beijo de Chocolat website.